Remember the story of the tortoise and the hare? The tortoise wasn’t fast and no one expected him to win the race but he did. In life people might be told they can’t do things or not expected to excel in a certain field but people will surprise you and against all odds do what they wanted and just because they might not always finish in first place, they finish the race. Now since this blog is geared toward clefts I will be using that as the subject by using my own experiences, but this post can pertain to anyone who has a goal/dream. As a “cleftie” there were things that I was told I couldn’t/shouldn’t do or suggested not to do. There will be times when people will frown upon what you want to do because maybe they don’t think it’s the best thing for you, perhaps maybe because they assume it won’t benefit you. To those people say “Thank you”, because you can prove them wrong. When it comes to how outgoing I am, I haven’t always been this way. The 9th grade was the first time I truly began to start coming out of my shell. I took a speech class that was not like speech as many of us clefties have to have but more of a public speaking type speech class. This class taught me to get up in front of an audience and speak on many different things. Although I have had speech problems and still have to speak slowly sometimes to be understood I found that speaking was something I did well. I took this a step further and began contest speech. Contest speech consists of going to contests at different high schools around the state and competing in a variety of categories among other high school students. Some of the categories that I ended up competing in through high school were humorous/dramatic duet, monologue, dramatic interpretation, original oratory, as well as a few other categories. As a freshman I only participated in a couple of the regional qualifying tournaments with a classmate in dramatic duet. Unfortunately we never placed but I found that it was something I thoroughly enjoyed. My sophomore year of contest speech I competed in several qualifying competitions and actually placed a few times. I took two events to the Regional speech contest but I didn’t make any of the final rounds. Do you think I got discouraged? Oh yes, I got discouraged. Do you think I gave up? Of course not! I pressed on, only this time I worked twice as hard as before. My junior year I qualified for three events to take to Regionals. I came out with my teammate and I getting sixth at regionals (alternate for the State competition) and got 2nd with my dramatic interpretation, meaning I qualified to compete in the State speech contest. I practiced my bottom off and came out placing 4th at State! My final year competing as a high school student I qualified in six events for Regionals. Sadly students are only allowed to take three events to Regionals (at least that’s how it was when I was in school). I took both duets with my two partners and my original oratory. At the Regional competition my senior year of high school my teammates and I advanced to finals in our duets; I also advanced to finals in my individual event. In the duet events we placed 6th and became 2nd alternates for the State competition. For my original oratory I received 2nd place at Regionals. I went to the State competition and placed 3rd place!! That moment of getting 3rd place ranks pretty high up there as one of my proudest moments. In order for you all to realize why it meant that much to me, you must first know what an original oratory is. An original oratory is a speech written by the competitor that should be as close to ten minutes as possible and the competitor is able to quote a certain amount of words in this speech. My original oratory was a motivational speech about overcoming obstacles. So now that you know about what an original oratory is and what mine was about you can see why I was so proud to get third place at State!! 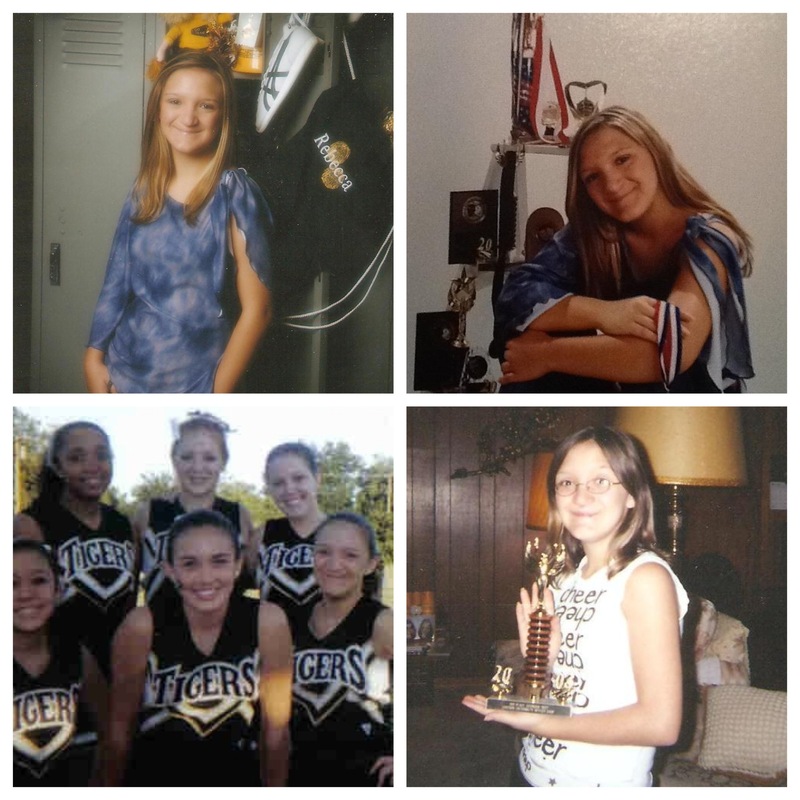 In 10th grade I had gained enough confidence to try out to be a high school cheerleader. Now if you are a cleft kid you know that all eyes are on you not just because of your apparent talent but because of your looks and scars. Despite worrying about those things I tried out anyway and to my surprise was selected as one of the cheerleaders. 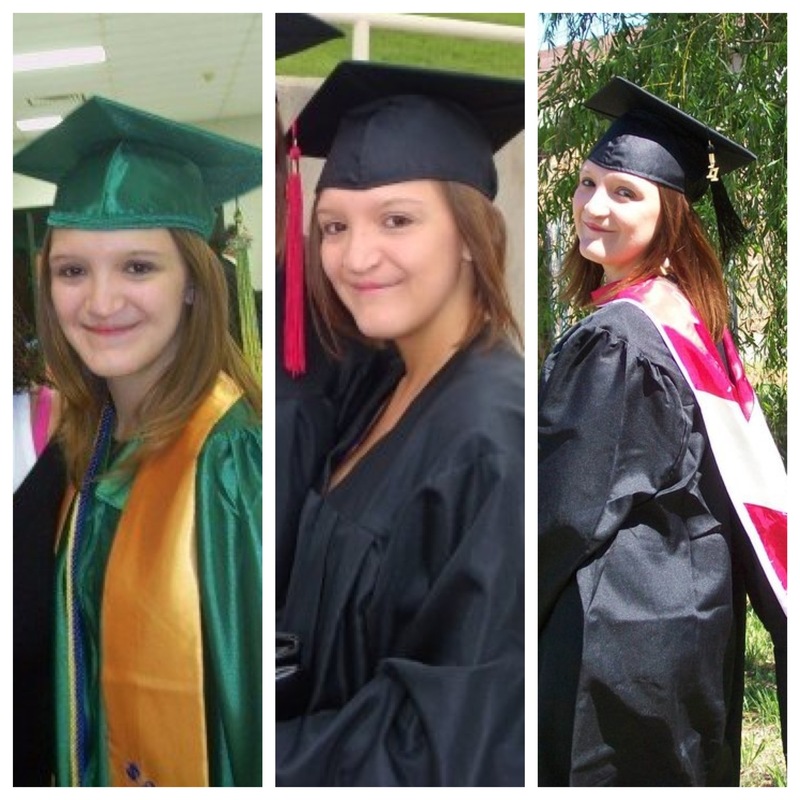 I ended up being a cheerleader the following two years. Miss SWOSU, Miss Mustang, Miss Queen of West, as well as many other are prelims to the state pageant for Miss Oklahoma. These pageants I refer to as scholarship pageants because they legitimately help ladies pay for college, however much of society refers to them as “Beauty” pageants. That being said, a cleft kid like myself might fear being in such a pageant, however I like a challenge. I was in a few pre-teen pageants in middle school/high school and received some awards but was still coming out of my shell and figuring out who I was. 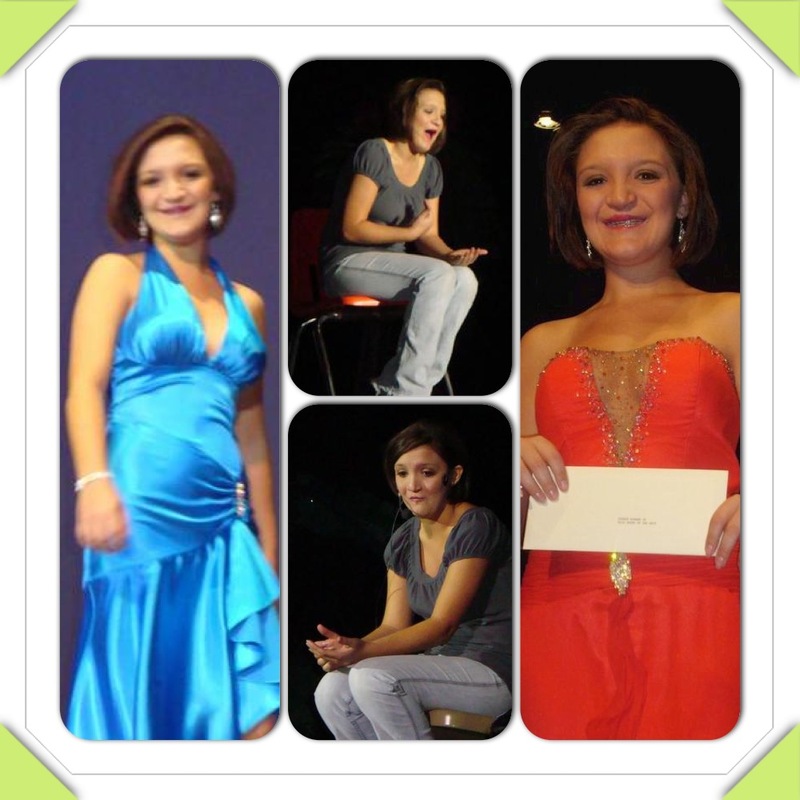 When I was in my third year of college I entered the Miss SWOSU (Southwestern Oklahoma State University) pageant. I put on my best smile and wore the gown and swimsuit as best I could. My favorite portion was talent though. I performed a dramatic monologue and I really thought I might win the talent portion. Although I gave it my all I came up short. I didn’t place in the top 3 nor did I win any of the few individual awards. While this was quite discouraging and I was most upset that I hadn’t won the talent competition, I didn’t give up. My family and friends and even several strangers told me I did great and that my monologue made them cry. This my friends was fuel, fuel to help me do better and compete for Miss SWOSU my senior year of college. The competition came and I showed off my posture in the evening gown and swimsuit competitions and gave my best answers in the interview portion that morning. For talent I performed yet another dramatic monologue. My on stage question came and the MC asked “Rebecca, what really grosses you out?” I thought for a few seconds and answered, “When you’re driving down the highway and you pass someone picking their nose. That really grosses me out”. Everyone laughed and the MC said, “Yes Rebecca that would really gross me out too”. The time came for the presentation of awards. Evening gown and swimsuit winners were announced and then the talent winner. My name, to my absolute excitement, was called as the talent winner. Once that happened I really didn’t care if I won the pageant or not since acting is my passion and that’s what I won on. The Peer Respect and Leadership Award (used to be known as Miss Congeniality) that’s voted on by the contestants was announced and I was floored when I was told it was me. The icing on the cake came when they announced the top 3; I was named 2nd Runner Up. While I didn’t win the whole thing I did do better than my first year and that was because I believed in myself enough to try again, practice more, and do my best. I did a few other pageants and won an award here and there. While I was never crowned “Queen” or “Winner” of these pageants I still had fun, gained more confidence, and gave it my all. As I’ve said before, it’s not about winning, it’s about doing. Specialist and told him my goals for my future. This particular VR Specialist told me that sometimes college isn’t the best path for some people and that perhaps I should go straight into the workforce. WRONG…Despite this advice I went to college and with the encouragement from my family and friends I got not one but three degrees. Take that “Negative Nancy” ;). Also I should note that I went to another VR Specialist and they encouraged me to go to college and I did in fact get financial assistance which just goes to show it’s nice to get a second opinion. Cleft Palate Foundation Cleft Palate Foundation is dedicated to optimizing the quality of life for individuals affected by facial birth defects. ClefTees Cleft related iron-on designs for adults, children, and even dolls. Tiny Wide Smiles – Doll Clinic Dolls and stuffed animals with clefts to fit the need of your child, as the site says, “Everybody deserves a buddy”!